Bed Nets And The Debate About Preventing Malaria : Goats and Soda Do they still help prevent disease caused by the bite of infected mosquitoes? A five-year study offers cause for concern as well as good news. 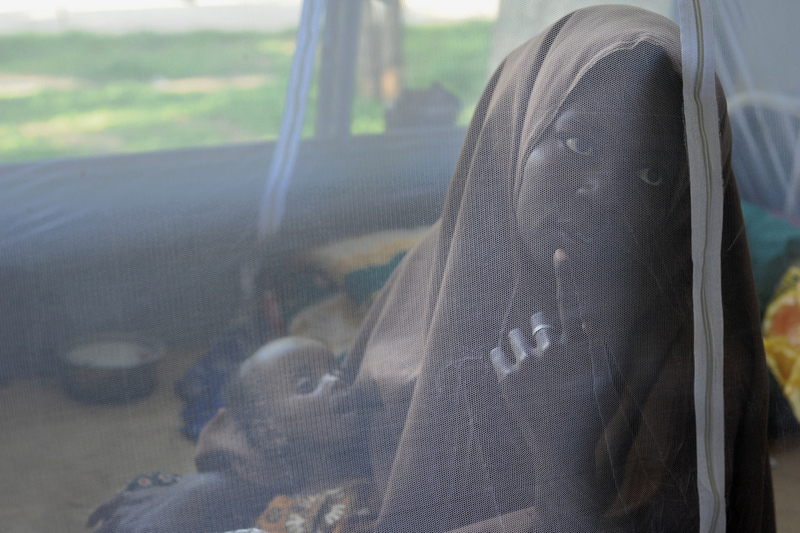 A mother and her 7-month-old daughter sit beneath a mosquito net at a hospital in Mogadishu, Somalia. Have bed nets lost their power to protect people from malaria-carrying mosquitoes? That's the subject of debate among researchers looking for ways to cut down on malaria cases and deaths. Over the past two decades, the insecticide-treated bed net has been one of the most powerful tools against malaria. The nets work in two ways. They block mosquitoes from biting people while they sleep, and the insecticide kills mosquitoes that try to penetrate the webbing and fail. So the nets not only provide protection for a single individual, they reduce the overall number of malaria-carrying mosquitoes in a community. Since the year 2000, more than a billion insecticide-treated bed nets have been handed out in Africa alone. Aid groups have also distributed them in impoverished malarial zones in Southeast Asia and the Americas. These insecticide-treated bed nets last for years and have been credited with helping to drive down the number of deaths from malaria dramatically. There were roughly 438,000 deaths in 2015, according to the World Health Organization, a significant drop from the 800,000-plus deaths in the year 2000. "Bed nets have been very, very important in controlling malaria in Kenya and elsewhere in Africa," says Charles Mbogo, the chief research officer with the Kenya Medical Research Institute. But there's growing evidence that mosquitoes are developing resistance to the insecticide used in the nets. Now the World Health Organization has just completed a five-year, five-country study looking into whether nets might be becoming less effective. On the one hand, the picture is bleak. WHO found that the insecticide has a range of effectiveness from 1 percent to 100 percent in Kenya. So in some places, the chemical killed all the mosquitoes all the time while in other places it hardly killed any. Elsewhere, the effectiveness of the insecticide ranged wildly. It was 20 to 100 percent effective in Benin, 47 to 100 percent in Sudan and 86 to 100 percent in India. The good news is that the effectiveness of the insecticide did not seem to have much impact on rates of malaria transmission. In areas where the insecticide barely worked, the nets offered the same level of protection as in areas where the chemicals still packed a knockout punch. "What we found in the study was that there was no clear indication that the impact of the nets was declining as we saw an increase in the resistance of the mosquitoes," says Tessa Knox, a technical officer in the Global Malaria Program at WHO. "So this is a very positive outcome because it means that this push to have universal coverage [with nets], it's justified based on the evidence we currently have," she says. Knox was part of a team that presented the findings of the study last week at the American Society of Tropical Medicine and Hygiene's annual meeting in Atlanta. But the new study didn't reassure everyone. Helen Pates Jamet is the head of entomology at Vestergaard, one of the world's largest producers of bed nets. She points to the study's findings that the insecticide in the nets has a wide range of effectiveness in actually killing mosquitoes. If that's the case, she says, the community benefit — the killing of malaria-carrying mosquitoes — appears to be evaporating. "The concern is that if we continue the way we are today by just putting out the same tool [pyrethroid-infused bed nets]," she says, "all the gains of the last 20 years will be reversed." Why is just one class of insecticide — pyrethroids — used in these nets? Because this class of chemical has been highly effective in the past and is the only one approved by WHO. The result, says Jamet, is the dramatic rise in mosquitoes that are immune to pyrethroids. Her company would like to see WHO sign off on more options. "The approval process for getting brand-new bed nets through with alternative ingredients, it's very muddled," she says. "It takes a very long time. It's a constantly changing process." Without WHO approval, international aid agencies won't put up the significant amounts of money needed to produce and distribute the nets. Other combinations of insecticides have been proposed for use in nets, but pyrethroids remain the only one with WHO's stamp of approval.